The Buckeye Battle Cry will be counting down the Top 25 players of the past decade all spring/summer. Every Monday and Thursday, Jim will be announcing a new player. Our #1 player will be presented on Monday, August 30th. Three days later, the 2010 season officially begins. Despite Krenzel’s undeniable ability to perform in the clutch and the fact that his play was always gutsy, he was never flashy or exciting, which is almost certainly why he finds himself at #13 on this list rather than in the top 5. Even though Krenzel’s reputation as a game manager will stick with him forever, his 4,493 career passing yards are the 9th most all-time at Ohio State and both of his seasons as a starter were top 15 for passing yards by a Buckeye. 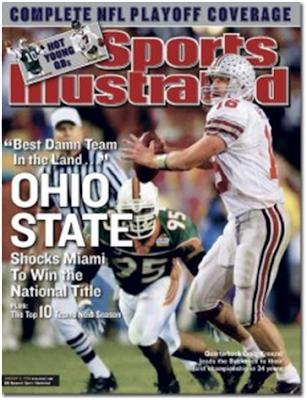 Throw in two Fiesta Bowl MVPs and if we re-did our voting for this countdown and I think I would bump Krenzel up a little bit higher on my list. Krenzel was drafted in the 5th round of the 2004 NFL draft by the Chicago Bears. He went 3-2 as a starter as a rookie before sustaining a season ending ankle injury. In 2005 he was signed by the Cincinnati Bengals and spent the year as the third string QB. An elbow injury that eventually required Tommy John surgery ended his football career in 2006. I would be remiss if I didn’t mention Krenzel’s work in the classroom. He graduated with a degree in molecular genetics and was an Academic All-American in 2003. Krenzel is still active in the Columbus sports scene and can be heard from time to time on 97.1 The Fan as a commentator, mostly during football season. For representing Ohio State with the utmost class and character in the classroom and on the field as a player and to this day, for leading Ohio State to the promised land in 2002 with ice in his veins, for two Fiesta Bowl MVPs, for a 24-3 record as a starter, and for putting up surprisingly good stats over his career for a “game manager,” Craig Krenzel is #13 on our list of the top 25 Buckeyes of the last decade.